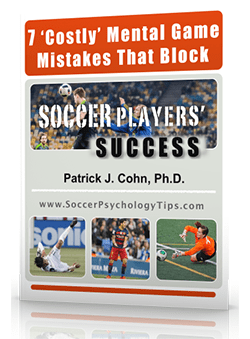 Playing a soccer game against a more physical team can be intimidating for some players. 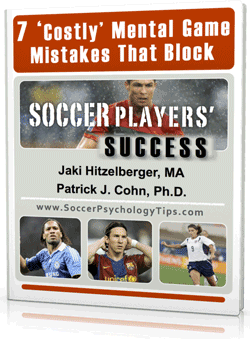 A team with highly aggressive or bigger players can take the focus off your soccer game if you allow. Soon, you will start to worry about getting fouled, injured or being physically dominated for 90 minutes. When you allow the opposing team to steal your focus, you are doomed. One soccer player I work with would be a shell of himself when playing physical teams. This player was an undersized but talented finesse player. During most games, he could weave through traffic, thread the needle on passes and score with regularity. Unfortunately, when he played against teams with a physical reputation, he would play with trepidation, avoid contact and force passes just to get rid of the ball quickly. He would get so anxious watching his opponents warm-up and fear would course through his veins. Even though he was skilled enough to outplay these rough opponents, he would freeze during the game and lose his confidence. He desperately wanted to find a way to overcome this problem so he could play the way he knew he could. Intimidation can affect even the best teams in the world. In an early season match-up against a physical Watford F.C., Arsenal F.C. manager Arsene Wenger felt his team was “was not mentally ready” to deal with Watford’s aggressive style of play. The Arsenal lost 2-1 and were down 2-0 after just 13 minutes as Watford dominated the first half using their size advantage to prevent the Arsenal from getting into the flow of the game. Wenger rejected the notion that his team could not stand up to Watford physically, blaming a lack of mental toughness. Intimidation has nothing to do with your opponent’s size/strength and everything to do with your mentality. Intimidation requires consent, meaning you allow the other team to dictate how you think, feel and play. When your opponents have your focus, the game is practically a foregone conclusion. 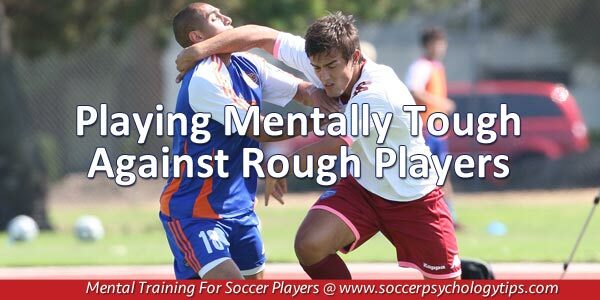 Competing against physically aggressive teams requires both physical training and mental toughness. It’s important to prepare for all types of opponents and different types of circumstances so you are confident you can handle whatever situation occurs during a game. When playing rough opponents, you may need to alter your game plan but you must stay focused on that game plan and play accordingly. When the opposing team cannot get in your head, they will start to play recklessly giving you the mental edge. First, know that many physically rough teams are looking to get you frustrated and scared to engage. Intimidation occurs when you accept that you are intimidated and play scared. When you focus on the other team’s tactics, remind yourself of your skill set or game plan. Focus on your speed, agility, quickness, and other talents to counter the opponent. 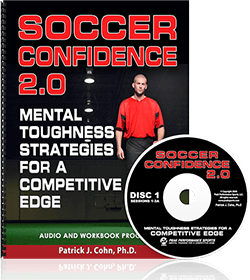 Improve your team’s mental game with our Soccer Confidence Audio program.